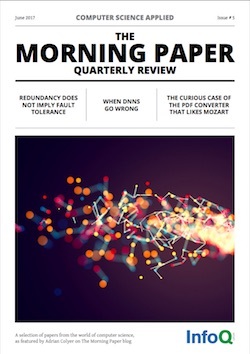 Welcome to the latest edition of The Morning Paper quarterly review. There are five posts chosen for you that appeared on Adrian Colyer's blog in the first quarter of 2017. This time around, they actually represent more than five papers though, as one of these posts is itself a collection of shorter summaries of a number of papers on a theme. If you enjoy the eMag Colyer writes up a new computer science paper every weekday and publishes it on The Morning Paper blog. If you prefer to have the day's paper delivered straight to your inbox, there's an option to subscribe to a mailing list as well. On the blog, you'll find a mix of past papers and current research results. Over the course of a year, subscribers to the blog will be exposed to just over 200 papers and ideas on average.